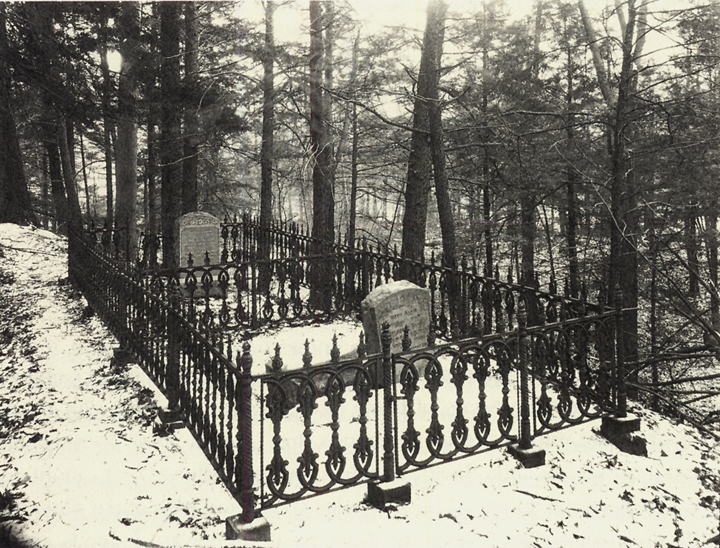 The Ellis family plot as it appeared in the early 20th century. For the past 186 years Mary Ellis has resided on what she probably thought would always be a stately piece of property overlooking the scenic Raritan River. In actuality though, Mary had really just been monopolizing a prime parking space for the better part of the Twentieth Century. The legend of how poor Mary came to rest beneath the asphalt of the Loews Theater parking lot on Route 1 in New Brunswick is a romantic, and ultimately tragic story, not unlike a Bronte novel. As the story goes, Mary Ellis came to New Brunswick in the 1790’s to stay with her younger sister Margaret. It was around this time that she met and fell in love with a man who was a sea captain, and former Revolutionary War officer. The Captain sailed down the Raritan and out to sea one day, vowing that when he returned he and Mary would be wed. He even left her his beloved horse to look after in his absence. Every day after her captain’s departure, Mary would ride his horse from her sister’s house, on what is now Livingston Avenue, down to the banks of the river to eagerly await a glimpse of her lover’s returning ship. In 1813, she purchased a parcel of farmland overlooking the river from which she would maintain her daily vigil. Mary died there fourteen years later in 1828, still faithfully anticipating her captain’s return. She was buried on the property, and was eventually joined by with her sister and other family members, and according to local lore, the captain’s horse. The plot, which was originally surrounded by an ornate wrought iron fence, lay in a rural, wooded setting well into the mid-20th Century. 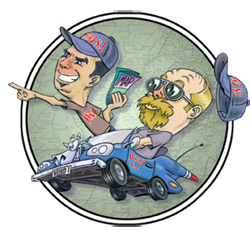 Over the years the ownership of the land changed hands several times, and the neighboring area has given bloom to a blight of strip malls, and discount outlets. Mary’s farm was paved over, and for many years was the site of the Route 1 Flea Market. 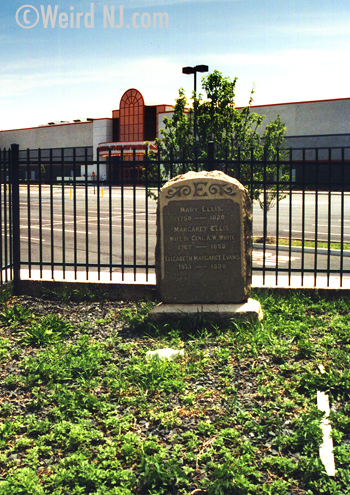 Mary’s grave at it appeared at the time of the Route 1 Flea Market demolition, circa 1993. Photo by Mark Moran. Stranded high and dry in the Market parking lot, Mary’s four-foot-high grave remained adrift in a sea of tarmac and bargain hunter-mobiles. For most of that time the small, grassy island was enclosed by a chain-link fence and sporadically maintained by Mary’s descendants. Often though, the weeds on the plot were so tall that one could park right next to the grave without even noticing the two-and-a-half-foot tall marble head stone inside. After the demolition of the Route 1 Flea Market some twenty years ago the property was redeveloped and became the Loews Cineplex. The parking lot was re-graded, making Mary’s grave stand even taller than before. Still parked in a prime spot, Mary’s grave has been given a new retaining wall, and a few small trees have even been planted close by. The final resting-place of Mary Ellis seems to have been given an extended lease. It’s just too bad the theater isn’t a drive-in. 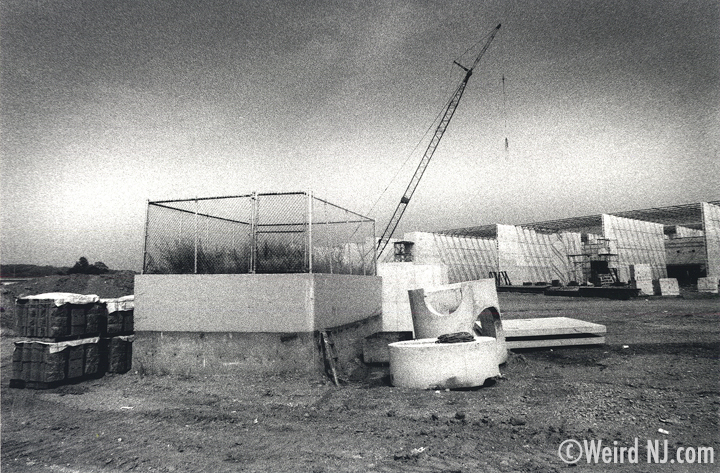 Mary’s grave during Loews Theatre construction, circa 1994. Photo by Mark Moran. A curious side note to the story of the parking lot grave is that it was believed by many to be the inspiration for the 1972 AM radio smash hit “Brandy (You’re a Fine Girl)” by the band Looking Glass. 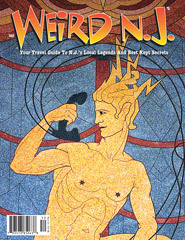 The local rumor was that the band, which was formed at Rutgers University in New Brunswick, wrote and recorded the song as an ode to Mary Ellis. “Brandy,” according to the song’s lyrics, was in love with a ship captain who could not leave his true love, the sea, to marry her. Sounds like a familiar tale, doesn’t it? Look Glass band members have denied there is any connection between “Brandy” and Mary. I read your Mary Ellis article and was intrigued. 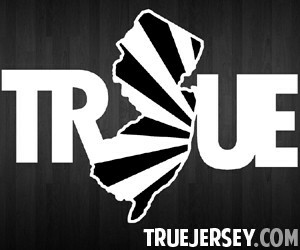 I grew up in New Brunswick and spent many hours playing in the woods along the Raritan River around the gravesite. In the 60s, the property was owned by the J.E. Burke Company. Their factory was close by Route 1 South and they had not bothered to clear or level the rest of the land. As you came down river from New Brunswick through old growth trees, you entered a clearing that was on a down slope from the highway. This sheltered it from highway and factory noise. On three sides were woods. The grave itself was on a mound about ten feet up from the clearing floor. Surrounded by the remains of an iron fence, the mound was swathed in thorny wild rose bushes. At the top the tombstone lay flat, and the epitaph was very clear. This may have been because the canopy of trees overhead formed a portico that covered the stone. The top of the mound offered a panoramic view of the Raritan, which must have been truly magnificent in Mary’s day before the Route 1 Bridge was built. The area had a dreamlike, fairy tale quality to it. It was never creepy or scary even to a little kid like myself. 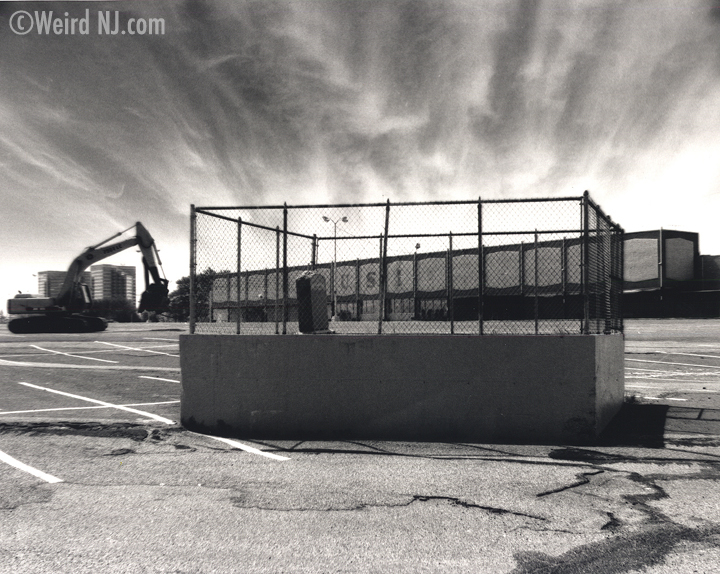 Sadly, construction of the Great Eastern department store that eventually became the Route 1 Flea Market destroyed the site. Far from being up on a mound viewing the river, Mary’s grave was down in a culvert often strewn with garbage. At least the latest property owner, Loews Theatre, has put the tombstone up on high ground again with a commanding view of the river. –Andy B. This entry was posted in Cemetery Safari and tagged brandy, edison, flea market, loews theater, Mary Ellis, middlesex county, new brunswick, parking lot grave, rarity river, route 1. Bookmark the permalink.